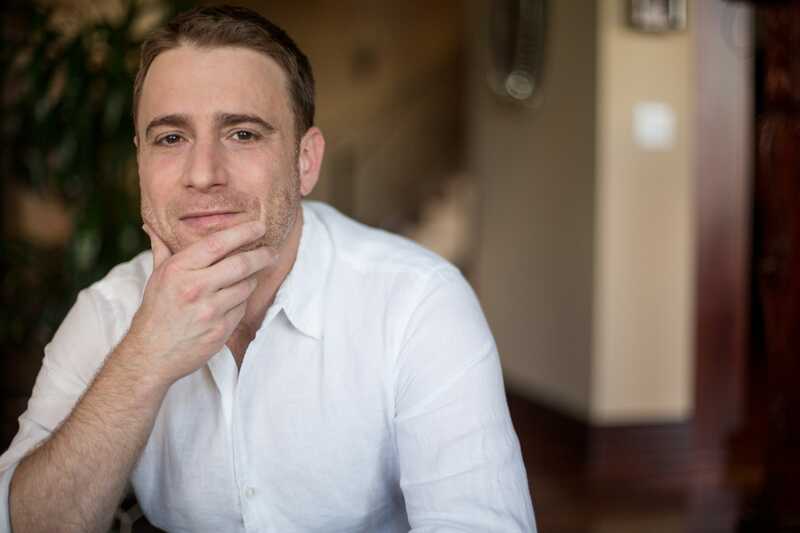 SlackSlack CEO Stewart Butterfield, 42, is a Canadian who still lives part of the year in Vancouver. He holds a master’s degree in Philosophy. 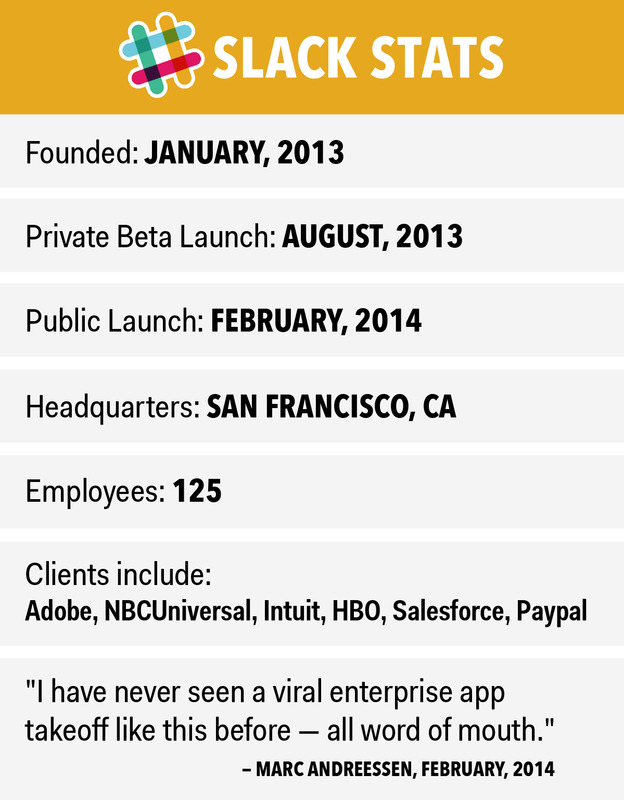 Butterfield says his background in gaming helped him create the immersive experience of Slack. In 2004 he co-founded Flickr, the photo-sharing service, which was acquired by Yahoo a year later. Last year saw the debut of Slack, an office communication tool that is both powerful and playful. The company just became the fastest startup in history to reach a $US2 billion valuation. Here’s the full interview, edited lightly for length and clarity. BUSINESS INSIDER: Slack broke the Internet last week with the news of its $US2.76 billion valuation. How did you grow so valuable so fast? One is that over the last five to seven years, companies have been able to scale really quickly in terms of revenue. People say “bubble,'”and we can have a separate conversation about that. With companies like Airbnb and Uber and Dropbox, regardless whether you think their current evaluations are justified, there’s really revenue being generated — so it’s not like 1999 or 2000 in that respect. The scale of revenue growth is unprecedented if you look back over history, whether you’re looking at the railway robber baron era or the 1920s or the ’50s or the ’70s. It used to take a long time for a company to get to the point where they had tens of millions of dollars of revenue. It was almost never an overnight phenomenon. Now more and more people are doing that. Whether that’s due to the spread of networks everywhere, the rise of the smartphone, the 500, 800 million people coming online at the same time, or the growing familiarity with messaging apps and platforms or the growing comfort with ecommerce, or any of those kinds of things — there are so many technological trends coming together that the overall climate is much easier. The second thing is that the investment environment is very hot. Our current valuation of $US2.8 billion — if we were in the same position a couple years ago, it would be half as much. Today, there are low interest rates and there’s a lot of money in alternative investment categories, particularly in venture capital funds. As VC funds get bigger, the dynamics don’t change. 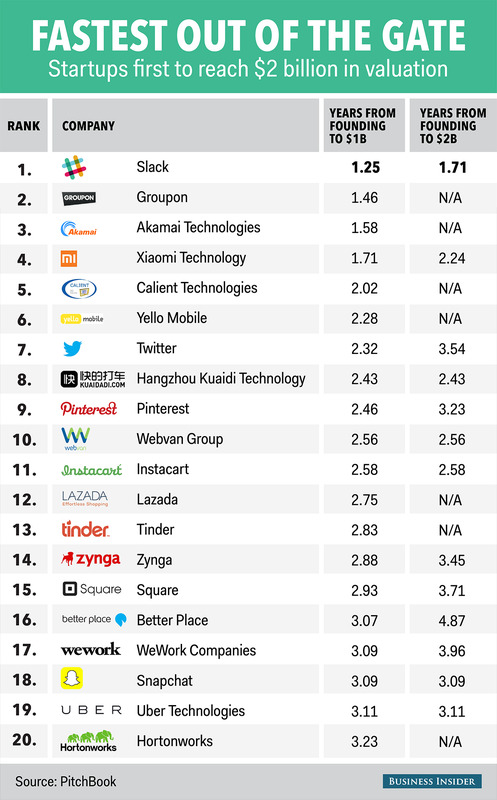 They still make the same number of investments, own the same percentage of the company; therefore the size of the valuations has to go up to make it all work. So there’s that macro trend. And third, there’s Slack. We’ve been crazily successful. Since we came back from the holidays, we doubled. That means that all the growth we had in 2014, we had again in a little over 3 months, and that’s not usual. We had a fast rate of growth in the early days at small numbers, but it kept up. We’ve had over 5% week-on-week growth for the last 70 straight weeks — and that has just continued. We’ve had over 5% week-on-week growth for the last 70 straight weeks — and that has just continued. There’s overall market dynamics, theres the technological shift, and there’s the ability of companies to get revenue much sooner. And then there’s Slack’s actual performance. BI: Let’s rewind. Before there was Slack, there was Tiny Speck. That company made Glitch, which we called “a quirky, lovely online game” back in 2012 when it shut down. How did you make the decision to pivot from Glitch to Slack? SB: It was actually two separate decisions. We came to the conclusion that Glitch was never going to be the kind of business that would have justified the $US17.2 million dollars in venture capital investment [that we had]. It might have been a neat project for a half-dozen people, if we had spent a million dollars to get there, but by the end of 2012, there were 45 people working on it, we had spent many millions of dollars, and it just wasn’t ever going to scale. So we decided to shut it down without knowing what we were going to do next. SlackWhile it seems like merely a fun and easy to use chat client — which it certainly is — Slack quietly builds a searchable conversation archive across an organisation. For example, in IRC, if you’re not online at the same time as me, I can’t send you a message. I have to wait until you are also connected. So one of the first things we did was build a way of archiving messages so that you could catch up when you came back online, and in those archives we wanted to be able to search them, so we added search, and so on. There was no good iPhone client, so we made an HTML5 front end for our archive viewer. By the time we shut down the game, again there was 45 people at the company, we had been in operation for three and a half years, and we had a company-wide email list. After more than three years, it only had 50 messages on it, so about one every three weeks. That wasn’t a deliberate decisions, that wasn’t ideologically driven. But it just happened that everyone paid attention to IRC, and the more people paid attention to it, the more information we routed to it, and the more information we routed to it, the more people paid attention to it. So eventually, everything from database alerts to daily sales figures were being pumped into IRC. Every time someone uploaded a file to the file server, that would be posted into IRC. While we weren’t successful in making the game, we were very efficient in being unsuccessful to make the game. BI: That really seems like the beginning of the behaviour that would define Slack — being a go-to place for intraorganizational communication. But here’s the big question: Can Slack really replace email? SB: It’s kind of a yes and no answer. To the big question, can Slack replace email period? No, definitely not. Email has the virtue — sounds like a bad thing, but it’s the virtue of being the lowest common denominator messaging protocol. Everyone can have it. It can cross organizational boundaries. No one owns it. It’s not some particular company’s platform. Like raw SMS, it will be around for a long time. Email will probably be around for many decades to come. It’s hard to say what will happen 20 years from now, but email has been around for decades, and it will likely be around for decades more. Inside a company, you can mandate that everyone use the same technology, which means you can go a little bit, I don’t know, higher fidelity than the lowest common denominator technology. There are a lot of things that Slack gives you that email doesn’t when you think about internal use. 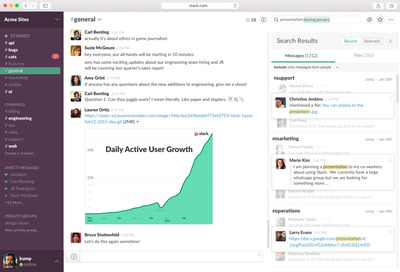 Switching to Slack from email for internal communication gives you a lot more transparency. No matter who you are in an organisation that is entirely email-based, you only get a tiny slice of all of the communication that’s happening. It doesn’t matter if you’re the CEO, the VP of engineering, or an intern on their first day, you only get this narrow little bit. No matter who you are in an organisation that is entirely email-based, you only get a tiny slice of all of the communication that’s happening. [With Slack,] everyone can see across these functional groups, which becomes hugely valuable. Whereas with Slack, the model is public within the organisation by default. It encourages the marketing team to have their discussions in the marketing channel and the engineering team to have their discussion in the engineering channel, which means that everyone can see across those functional groups and see what other people are working on, which becomes hugely valuable. No one person is going to be able to pay attention to everything that’s going on in a sufficiently large organisation. We’re 125 people, we do tens of thousands of messages a day from people, many more messages a day from integrations, but when I want to, I can look into what any group is doing and where they’re at and what challenges they’re meeting. The engineering team can look at what’s coming up for them, and the marketing team can see where the accounts team could use additional support, the technical operations team can see what kind of issues the customer support team is dealing with, and that kind of stuff is huge. The big benefit is that you’re building, in the normal process of communication, this archive that is hugely valuable, so that five years from now — or today — when someone starts at Slack, there’s literally millions of messages in our archive that are all available to them and all searchable. Contrast that with an email-based organisation, where on your first day of work, you have nothing. You literally have an empty inbox, and if the company has exchanged hundreds of thousands of messages before you got there, none of that is accessible to you. SB: There’s a couple of things. I learned so much in the year after Flickr was acquired. People forget, but Flickr launched in February 2004. And a year later, the deal was done with Yahoo, and we closed it in March of 2005. It was really independent for a relatively short period of time. 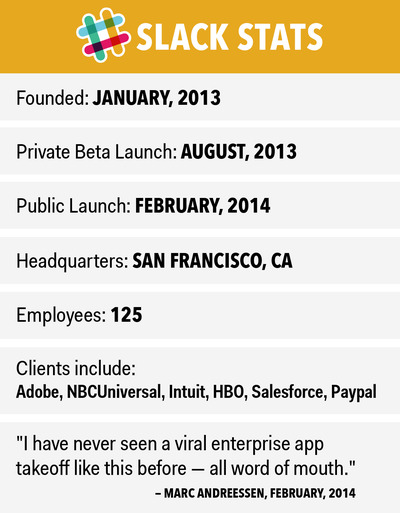 And that first year, Yahoo was just — I had never worked at a big company before, and I had no idea. I had consulted for big companies, but that’s very different. You don’t see inside, you touch the periphery, the small group of people that you’re dealing with. And suddenly, it was like a crash course the the dynamics of of large corporations. There were a lot of politics and turf wars and a lot of wasted potential as a result of a lack of unity around the purpose of what people were doing. Some people would show up to work every day, really looking out for themselves as opposed to trying to collaborate to create something amazing. We focus very hard on the culture here to try and get everyone into alignment and get their satisfaction in making something that’s amazing. SB: In one sense, it’s a lot easier at Slack, because we’re 125 people. Yahoo, when I joined, was at about 10,000 people. We’ll see when we get to 10,000 people. But it’s been a lot of careful hiring, a lot of people who share the same values, a lot of people who aren’t exactly the same as us, but people who get excited at the idea of doing a really good job of something. That’s a general inclination for attitude towards work, which doesn’t just exist in tech. My favourite examples are usually from restaurants, where in a really well-run restaurant, it doesn’t have to be an expensive restaurant, but in a well-run restaurant, everyone has to work together, and everything matters. The freshness of ingredients; the way that they’re cooked and prepared; the way they’re presented. But also the amount of time you have to wait before you sit down, if you’re offered a cocktail while you wait while you’re waiting, the noise levels in the room, the feel of the tablecloths and everyone who’s working together has this tight feedback loop and almost unspoken way of cooperating, so if you’re one of the servers and you’ see that someone else at the table is waiting for their check, you communicate that. You try and time everything in the kitchen so that all the dishes get prepared at the same time. That kind of cohesiveness across the team and that investment that people have in doing the best work they can do is something we look for, regardless of the particular background, whether it’s business or marketing or where people were born or any other aspect of who they are. To the extent that we can continue to find people that are excited for that, I think we’ll be able to preserve that culture. BI: What are you guys going to do with all this money? You’ve said in other interviews that you’re looking at acquisitions. What sort of areas are you feeling out? SB: We don’t have anything specific in mind. We’re pretty opportunistic. And really the thing we get out of having the cash in the bank at this point is options. We’re in a really good position where when opportunities arise that we want to take advantage of, we can just do them. Whether that’s acquisitions, international expansion, advertising — whatever it is that comes up that feels like the best move for the business, we will take advantage of. Having the freedom to pursue opportunities without the constraint of capital enables all kinds of things which otherwise wouldn’t have been possible.